ND: What kind of interactions did you have with Intelligent Systems, the developer of Fire Emblem? Usuda: Intelligent Systems handled the supervision of all character quotes, including what’s called the Bond Conversations. Hayashi: Since it’s also fully voiced, there’s an enormous amount of them. ND: Are Bond Conversations going to expand separately from story progression? Hayashi: They’ll be different. If you put in this character and this character [read: putting two characters in the same party for a battle] they’ll get along, and as a reward, conversations unrelated to the story will occur. ND: In that case, does that mean you can write stories with freedom without getting tied into the story? Usuda: Yes. Our writing team is of course also comprised of people who like Fire Emblem, so we also keep putting screws in there (note: trying to improvise on writing the scripts). They’ve been saying things like ‘This character and this character are going to get along!’ (laughs). Hayashi: [Some people] are indeed glad to [see] Support Conversations in the original works, so we’d like to definitely pour our effort into the conversations. Both Nintendo and Intelligent Systems are ready to give their consent, so at first we proposed to make Bond Conversations for every single character combination. However, in that case, it would end up having an astronomical amount that would make it impossible to develop (laughs). So in the end we just included some character combinations that we’d be really glad to see. To compensate, we’re pouring our effort into each of them. ND: Is it alright if we think of it as Bond Conversations occurring, transcending between series? Hayashi & Usuda: (shouted at the same time): There’s no meaning if we don’t do that! Usuda: For example, for Chrom and Marth, Chrom will get to meet Marth who is said to be that legendary hero-king. In that case, you would wonder what kind of talks they will have. ND: I’m really wondering about it, but I think creating it may seem quite hectic. Usuda: We did have some rough passages. For example, if Awakening or Fates [characters] said something strange, there’s a possibility that they would be viewed as married couples (OTPs). After all each user has their own ways of playing the original games, so we proceeded cautiously while consulting with Intelligent Systems. They have been cooperating very well, and suggesting things like ‘If they speak like this, it would fit their characters better’. We meant to send them just for supervision, but they would also sometimes reply with quotes that have been brushed up by them, so we thanked them for that. Hayashi: This supervision is really great. Conversation files with enormous volumes were being updated daily. We understand that Intelligent Systems cares for each single character, so we feel we can’t unleash things half-heartedly either. ND: Recently there have been many games about the gathering of series, but such a festive feel of series connecting is one of the exciting parts of a collaboration Warriors game, isn’t it. Hayashi: Yes. Furthermore, our strength is in being able to control characters with quality that [Fire Emblem players] would normally only see in pre-rendered movies. They’re even fully voiced as well. Usuda: In exchange for narrowing down the amount of titles, by digging deep into each of those titles, we think we can take care of a crossover where characters from those three titles can have deeply adorable conversations. We think that should be the part that’s possible because it’s Fire Emblem Warriors. For character affections, we’re pouring in all the affections that we have, so we hope they can shine brightly there. ND: Why do you have three titles as the basis this time? Hayashi: Because we want to make it a Warriors game where you can properly use the distinguished classes. Even so, if we were to put in protagonists from every series, most of them would end up becoming Lords. In that case everyone would have swords, so there wouldn’t be any strategic systems with switching characters or even anything else. So just like how we chose three 3D titles in Hyrule Warriors, we’re doing the same selection method too this time. That means we want to put an emphasis on the gameplay of switching classes, so we went on with narrowing down the titles… However, just like the fans, even a number of our own staffs cannot fathom it. ND: It’s precisely because they have fondness towards the characters. So how did you manage to convince them? Hayashi: If this game is well-received, we may be able to make a sequel (laughs). That’s why this time we’d like to narrow it down. ND: As a result, right now there are three titles. Hayashi: Yes. So among those three titles, the reason why we chose Shadow Dragon is simple. A Fire Emblem without Marth is not a Fire Emblem after all. ND: Indeed. But are there any reasons you’re using the DS remake instead of the original version? Is it because the original game didn’t have the weapon triangle? Hayashi: That may also be the case, but the big one is that the designs are based on the DS remake. Usuda: And there’s also the fact that the DS remake of Shadow Dragon was also released overseas. Well, there’s also a difficult point here, and there’s also someone among the staff who still prefers the first original game after all (laughs). However, we’re proactively including homages based on the original game, so I think people shouldn’t be bothered on whether [they’re coming from] the original version or the remake. 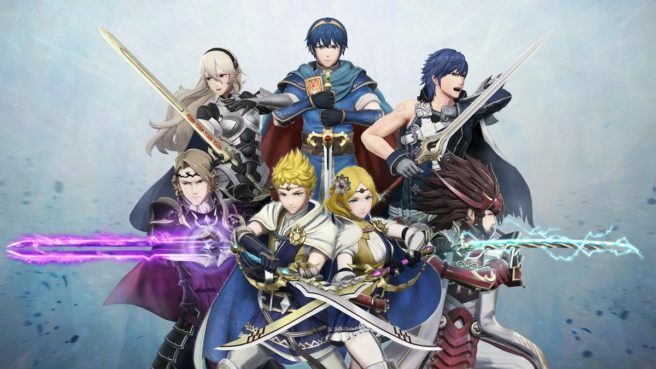 ND: So if Fates was chosen because it’s the newest title at the time of development, then what’s the reason Awakening was chosen as the remaining title? Hayashi: When we have to choose three titles, it’s a natural decision we’ve made. After all, Awakening feels like a compilation for including Fire Emblem features in the current orthodox way; and we as users feel that is a big one. When we had to pick three 3D titles for Hyrule Warriors, we went with Ocarina of Time, Twilight Princess, and Skyward Sword. I also like Majora’s Mask, but if we had to choose three titles it would feel a bit out of place. Of course, right now there would be Breath of the Wild, so we would have some hardships in selecting three titles [if we were to choose three titles for Hyrule Warriors now] (laughs). That’s why it felt like the three titles were decided on smoothly this time [for Fire Emblem Warriors]. ND: For those three titles, from which point would they cross over from their original stories? Usuda: For example in Shadow Dragon, Marth still hasn’t become a hero-king yet. We’re making it so that people who don’t know the original games can still enjoy it, so we’re making them ambiguous. But we’re somehow making those kinds of settings. I hope you can read them from the storyline quotes. ND: I see. Actually what I’m wondering about the most is Fates. Because I feel like a lot of things are different between the end of Revelation and otherwise. Usuda: That’s right indeed. Fates is a rather difficult one. Hayashi: But I feel like Anya/Nohr and Byakuya/Hoshido characters getting along would be out of place. ND: I feel refreshed. Speaking of which, the Kamui/Corrin announced this time is the female one. Hayashi: We intentionally made Kamui/Corrin into the female one. Because we don’t want the [main] visual we’ve announced right now to consist of only males, and female Corrin is also very popular. Even so, it’s still hectic for us to choose which characters to put in after settling with the three titles. ND: How hectic indeed. Users will also see that as the biggest point after all. I think Hyrule Warriors was that good; so many people already have good faith that ‘the game will be interesting’. That’s why everyone is putting their focus on ‘which characters will come out’. Hayashi: We’re thankful for that, but it can also put on quite a lot of pressure. Hayashi: We had a really hectic time in choosing them. At first our company considered from the weapons first and sent the proposal [list], but Intelligent Systems pointed us to the results of popularity polls, and Nintendo also told us ‘please add this character’, so we adjusted it little by little. ND: Will the appearing characters be equally numbered from each series? Usuda: They won’t be exactly equal. In exchange for that, the total number of characters is a lot for the first title in a collaborative Warriors game. Hayashi: Other collaboration Warriors including Hyrule Warriors at first only had around eight to fifteen characters, but this time it will exceed them in a large scale. They’re being physically added so it’s getting hectic, but we feel we must pour our full effort here. Even so, the fans will still end up thinking it’s not enough. So although we do feel sorry about that, we’re doing our utmost to our limits.